SEQUENT will launch on kickstarter.com on July 5 at 6:00 p.m.-CET, the revolutionary "SuperCharger" hybrid smart watch with a major breakthrough in technology. SEQUENT is proud to introduce a new generation smart watch with a kinetic self-charging battery system, which provides infinite power supply. Therefore, the great news is that NO MORE ADDITIONAL CHARGING from socket-outlets or cell coin batteries is required. SEQUENT has not only solved a major problem of the smart watch industry, which suffers from insufficient battery supply for its devices, it also generates 100% clean energy. The watch features the newest generation of Heart Rate sensor, GPS tracking and notification system, which can connect by Bluetooth to the proprietary Biofeedback health & sport app. 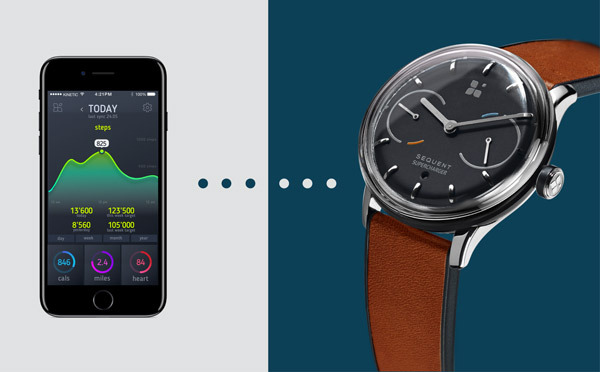 The prices for the SEQUENT "SuperCharger" smart watch starts from USD 149. "We are the first ones who mastered the transformation of kinetic '100% clean' energy into infinite electrical energy to power a smart watch. Some already say that we will become the TESLA of the smart watches and wearable industry as we share the same vision," CEO Petra Guhl said. "After more than three years of intensive research & development, we are proud to launch a smart watch with a breakthrough technology that will redefine the future of all smart devices," designer Adrian Buchmann said. SEQUENT is a start-up, founded in Luzern (Switzerland). Over three years, the company has developed and patented world's first self-charging system to power a smart watch and has set a new important milestone in the development of smart devices.